With a Seaford career spanning an incredible 22 seasons, Jamie stands above all of the other club legends of the modern era. Blessed not only with exceptional ball skills and passing ability, but a knack to read the game and bring order to the chaos around him, Jamie operated as a creative midfielder and occasional ball-playing centre half. As his athleticism declined, his contribution to the team didn't, as he became the fulcrum of Ronnie McLoughlin's side that won consecutive promotions between 2009 and 2011, bagging a rare brace in a crucial away win against Pegasus. 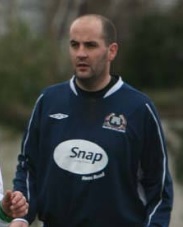 Jamie's brilliant knowledge of the game made him an ideal candidate for management, and he assisted first John Toomey with the seconds and then Alan Burns with the firsts, whilst also making cameo appearances on the pitch into his late thirties and beyond.